Oolong (pronounced wu-long) is a Chinese or Taiwanese semi-oxidized tea, spanning perhaps the most diverse spectrum of flavor and body between Green and Red/Black Teas. 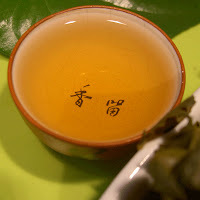 Oolong is regarded as the ultimate art form in tea-making in Taiwan, which has adopted and perfected the brewing method for it, known as Gong Fu. The Gong Fu style of serving tea originated in China, but at some point reached epically proportioned importance in Taiwan (formerly Formosa, thus the name of many Oolongs grown in Taiwan). In the Gong Fu style, very small tea pots made of an especially dense clay called Yixing (pronounced ee-shing) are used because the residue or tea oils from the tea more easily accumulate in the pot, seasoning it with the flavor of the one kind of tea reserved for that particular pot. After decades of use, simply adding hot water to the pot alone can yield its own tea from the years of tea oil accumulation. The combination of short brewing times, lots of leaf and the small capacity of the Yixing pots produce multiple steepings of what is considered the very essence of one of the highest forms of tea. Ask your Tea Tender about Gong Fu service. Deluxe Ti Kwan Yin – Named after an incarnation of the Buddhist deity Kwan Yin, or “The Iron Goddess of Mercy,” Ti Kwan Yin is a family of its own within the Oolong style. Ranging from straw-colored infusions of delicate quality to robustly roasted and nutty brews, Ti Kwan Yin always somehow retains a unique flavor found in no other kind of tea.